N.K Industries Based In Ahmedabad, Gujarat , India Is Reputed Manufacturer ,supplier And Exporter Of High Quality Range Of Ampoule Labeling Machine. High Production Speed up to 250 Ampoule/min depends upon the body diameter of ampoule. Provision for Online Batch coding printing like Inkjet printing can be easily accommodate. No Change Part for Label Size. 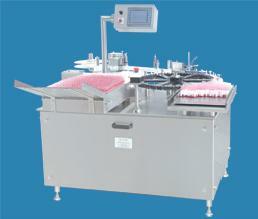 With tray, the ampoules are loaded to the in feed conveyor. The infeed conveyor belt is a endless pvc belt which carries the ampoules towards the labelling section with the help of feed worm. The in feed worm picks the ampoules and transfers the same by keeping pre determined space between two ampoules to the rotating star wheel. The star wheel carries the ampoules and moves towards the label applicator. A sensor for sensing ampoule is fitted before the label applicator which senses the ampoules and in turn, servo motor allows the label applicator to release one label which gets sticked on the ampoule. One label sensor is provided in the machine which senses the gap between two labels. This ensures that only one label is applied to the ampoule at a time. Once the label gets sticked to the ampoule it passes through the pressing belt where the labels get properly pressed without giving any crease. After this the ampoules are guided to the out feed tray where the ampoules are collected and taken for the next operation.